The basis trade is an arbitrage, basically. There are two different ways the market measures credit risk: by looking at credit spreads — the yield on a certain issuer’s bonds, relative to the risk-free rate — or by looking at CDS spreads, which are basically the same thing but set in the derivatives market rather than the cash bond market. Most of the time, CDS spreads and cash spreads are tightly coupled. But sometimes they’re not. Long story short, a JPMorgan trader placed some humongous bets that credit spreads would go up relative to CDS spreads, and instead the opposite happened. Eventually, everything went kablooey. Jamie Dimon, JPMorgan’s CEO, agrees, but has a different problem: “It plays right into the hands of a bunch of pundits out there,” he said exasperatedly today. You see, Dimon has been scathingly critical about the Volcker Rule, which prevents banks from making proprietary trades, and now he’s just announced a huge loss from making proprietary trades. He insists, however, that the basis bets were a legitimate hedge, not just a bunch of casino-like bets. And then there’s me. The lesson I’d take from this is that the Volcker Rule ought to be beefed up. Because here’s the question: what possible social good is there in allowing gigantic multinational banks to make gigantic bets on how one particular financial index will move compared to a different financial index? I can’t think of one. The Dimon argument is that real-world companies have legitimate hedging concerns, and the only way they can execute their hedges is if someone else takes the other side of the hedge. 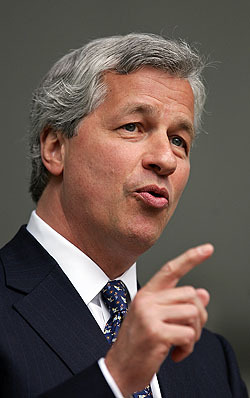 If that someone is JPMorgan, then they’re performing a valuable service. At some point, though, you just have to ask: Really? We’re supposed to believe that Bruno Iksil, the trader in question, was merely performing a financial service for some of JPMorgan’s clients? Do you believe that? I don’t. I think he was making gigantic bets and then furiously looking for suckers he could sell the other side of the bet to. Except this time he turned out to be the sucker. I dunno. At this point I’m beginning to wonder if we should even be worrying about real-world companies and their hedging requirements. On net, maybe we’d be better off with no one executing hedges instead of everyone executing hedges, since in practice there seems to be no middle ground. Once you concede that nonfinancial companies can hedge, it’s a short hop, skip, and jump before it’s impossible to distinguish between hedges and bets. No one seems to have a good idea of how to make the distinction in a reliable, consistent way. Maybe it’s time for us all to simply accept that the world is risky — in fact, time to have our noses rubbed into it, something that might force us to pay closer attention to what we’re all actually buying and selling. Maybe it’s time to accept that using the financial system in a vain attempt to pretend that risk can be hedged away does more harm than good. That’s most likely impossible at this point, and probably owes more to a tetchy mood than a deeply considered position. But honestly, it’s hard not to think that until the casino culture of Wall Street is well and truly reined in, we’re just in for endless trouble. When times are good — or, in any case, not too terrible — losing a couple billion dollars is just an annoyance for JPMorgan’s stockholders. When times are bad, though, all bets are off. Literally.